We recently sat down with attorney general-elect Phil Weiser to discuss one our favorite subjects: democracy. 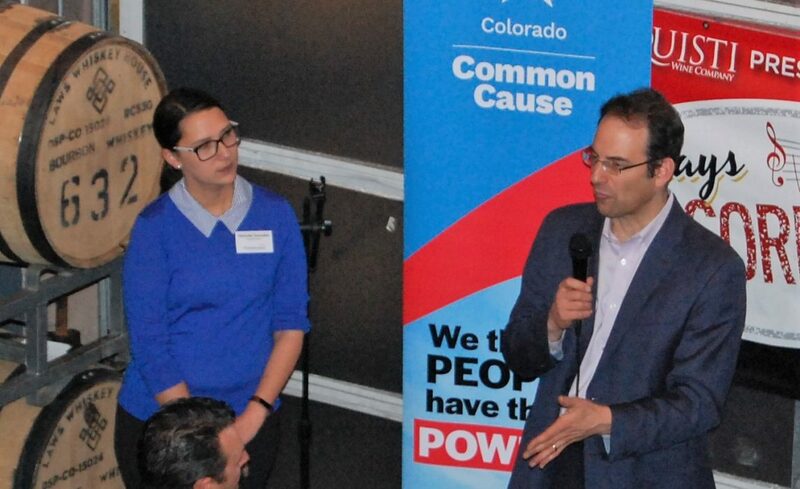 On December 4 2018, Colorado Common Cause and newly elected attorney general Phil Weiser sat down to talk about one of our favorite subjects: democracy. The building buzzed with excitement and enthusiasm for the coming year. Colorado Common Cause Executive Director Amanda Gonzalez took the stage with AG-elect Weiser, leading an engaging conversation. What followed was a discussion about clerking for Justice Ruth Bader Ginsburg, dark money in Colorado elections, what can be done about the travel ban, strengthening open records, signing Colorado onto the national popular vote compact, and how he will work with Governor-elect Jared Polis. About 40 percent of all money spent in Colorado’s 2018 election came from dark money sources, according to Weiser. Dark money groups can be defined as organizations who influence an election without disclosing their donors. Weiser went on to explain how this was a direct contradiction of the majority opinion for Citizens United, which stated that while money spent in elections can be unlimited, it must come from traceable sources. Weiser expressed a need for strengthening Colorado’s open records laws, as a transparent government is one that is more likely to comply with the law. Transparency means accountability. He expanded on this topic to the status of journalism in our nation. He expressed unwavering support for the 4th estate, noting that that a free press is explicitly mentioned in the constitution. When asked about the national popular vote interstate compact, the AG elect expressed enthusiasm for supporting this effort. The compact would allow for a direct translation of popular votes into the selection of the President. It would also mean that candidates would have to campaign in every state for votes – not just swing states – ensuring that more voters are represented in the Presidential election. This, he believes, is a core tenet of democracy. We thank Attorney General-elect Weiser for taking the time to discuss democracy issues with our members – and we look forward to holding him, along with our other elected leaders accountable, when he takes office in January.